MEXICO CITY (Sputnik) – Venezuelan President Nicolas Maduro has accused the government of his US counterpart Donald Trump of stealing $5 billion from the South American country, saying these funds were allotted for the manufacture of medicines. "The government of US president Donald Trump stole from us $5 billion allocated for medicines and the purchase of the main substances for the production of medicines in Venezuela and their deliveries to hospital networks, pharmacies,and ambulance network", Maduro said during an event devoted to the relaunch of a Venezuelan national programme to develop the pharmaceutical industry. The president said Trump was responsible for "the most criminal measure" against the Venezuelan people in order to subsequently say that the US authorities were ready to provide humanitarian assistance to the South American country. On 23 January, two days after the Venezuelan Supreme Court annulled his election, Guaido declared himself the country's "interim president". 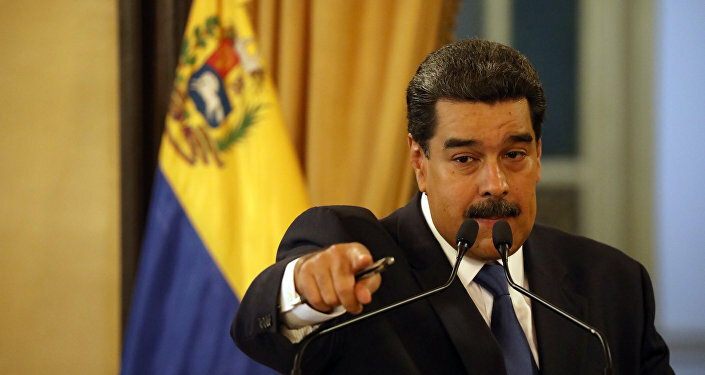 Maduro, who was sworn in for his second presidential term on 10 January after winning the May 2018 election, which part of the opposition boycotted, qualified Guaido's move as an attempt to stage a coup orchestrated by Washington.